Is there an engineering skills shortage in Europe? In the UK, according to the organisation EngineeringUK, yes there is. It estimates that, between 2012 and 2022, there will be an annual shortfall of 69,000 skilled engineers in the UK; engineering companies will need to recruit 2.56 million people during those 10 years, 1.82 million of them with engineering skills, and there aren’t enough students entering apprenticeship schemes or degree courses at the moment to meet that demand. Internal VDMA calculations, based on the official unemployment statistics for Germany, see the demand for engineers in the mechanical engineering sector at around 6,000, according to Weber, although he added that this is not necessarily a lack of engineers, but the number of open positions that currently need to be filled. Why is all this important? Well, the engineering sector creates wealth. According to EngineeringUK, engineering is 68 per cent more productive than the retail and wholesale sector, and every time a new job is created in engineering, two more jobs are made elsewhere in the UK. In 2014, engineering generated £455.6 billion GDP for the UK, and the organisation forecasts an additional £27 billion GDP per year if the sector could meet the demand for job vacancies. Machine vision is a small subset of this much wider issue, and figures on supply and demand of engineers finding jobs in this area are hard to come by. What makes machine vision special, and consequently makes it quite difficult for companies to find staff with the requisite experience, is that it’s multidiscipline. ‘You’re talking software, optics, electronics, automation, among others. Trying to find people that can cover all these disciplines is very difficult,’ commented Peter Bhagat, CEO of UK machine vision lighting company Gardasoft. The University has been offering courses in optical engineering and machine vision since 1997 and has close contact with industry; almost all the students do their theses in industry. ‘It’s always difficult to get reliable data about whether there’s a shortage of engineers in Germany – particularly machine vision engineers – but I can say that all our graduates have no problems getting good jobs,’ Heckenkamp commented. ‘A lot of companies offer internships and positions where students can complete their theses, as well as positions for young professionals with qualifications in machine vision and optical engineering. Stemmer Imaging’s Puchheim headquarters has ties with the Munich University of Applied Sciences (MUAS), which also offers machine vision Bachelor and Masters degree programmes. ‘If a student’s thesis is in a field that Stemmer Imaging is active in, students have an opportunity to conduct experiments and write their thesis at our company,’ explained Peter Stiefenhöfer, marketing and public relations manager at Stemmer Imaging. Each year Stemmer Imaging also donates money for two good theses at MUAS, one Bachelor and one Masters, as part of an award scheme. The company consults with the supervising professors at the University in order to give two awards to the students with the best theses. Stemmer Imaging also organises transport and entry fees for around 30 to 50 students from MUAS to visit the Vision show in Stuttgart. ‘We’re working closely with a professor at the University who’s keen on sending his students to the trade fair, not just to see the technology, but he sets tasks for the students to investigate and write a report or give a presentation, which is then marked and goes towards their final grade for their diploma,’ Stiefenhöfer said. EngineeringUK runs various outreach programmes, including Tomorrow’s Engineers, which links schools with local employers to increase awareness about engineering and give pupils an idea of what engineers do for a living. The F1 in Schools initiative is another good example of a social enterprise working with industry to get children interested in science, technology and engineering. F1 in Schools operates all over the world – not just the UK – and teams of students from nine to 19 years old compete to design and build the fastest racing car. 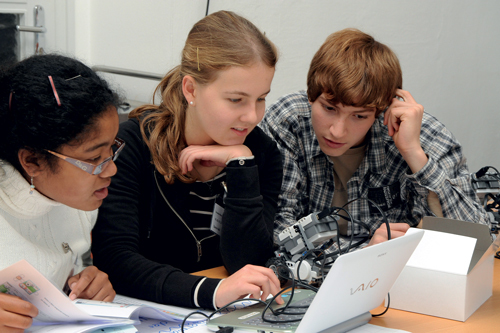 Weber at the VDMA would like to see more technology taught in German schools. He said there are several good examples of projects for different age groups – even for very young children in preschool – but there is still a lack of suitable opportunities for children to learn about technology. ‘We [ the VDMA] recommended that the German ministries for education in the federal states adjust school curricula and – very importantly – teacher-training. This will lead to more interest in, and a deeper understanding of, technology,’ he said. Germany could arguably be said to have an engineering culture – more so anyway than the UK, for instance. However, Heckenkamp feels more can be done: ‘It is true that getting school children interested in engineering is part of Germany’s culture, but it’s not enough. We could easily educate two or three times the number of students that we have now [studying machine vision] at the University and we could easily place them in industry. ‘In spite of all the efforts made in advertising and going to schools directly, it’s not possible to attract a huge number of young people to study in this field [machine vision],’ he continued. But what’s needed, according to Weber, is for university students to learn more practical skills in engineering courses. ‘[Companies] miss practical experience in young engineers and want universities to incorporate more practical elements in their curricula,’ he said. Downey at Gardasoft also feels applied engineering training is lacking from UK universities. ‘There are some very well qualified people, but understanding the real-world application of what they know in theory takes time, because they’re not trained that way, certainly not in the UK,’ he commented. He said a noted exception, though, was the University of Cambridge’s Institute for Manufacturing, which trains its students in how to apply engineering theory to real-world problems. Courses like those run by Darmstadt University of Applied Sciences and MUAS, which have links with machine vision companies and where the students write their theses in industry, are also good examples of applied learning. German company Vision and Control has also set up an industrial image processing professorship at the Ilmenau University of Technology to help train engineers. Downey said that this principle needs to be adopted by other universities in the UK. ‘In many cases, certainly in the UK, that seems to be a missing gap to me, and maybe makes it less attractive to those students who find it easier to understand the technology when they’re applying it to the real world,’ he commented. But maybe there is already the start of a groundswell in interest in new technology in schools. ‘Raspberry Pi and 3D printing are tools that anybody can pick up and play with and get a result out of,’ Bhagat of Gardasoft commented, ‘and they might just push things to some extent back the other way and inspire people in terms of engineering and electronics and design, just because they are easy to use.’ Robotics is another area that’s gaining traction in schools through the Lego education programme.